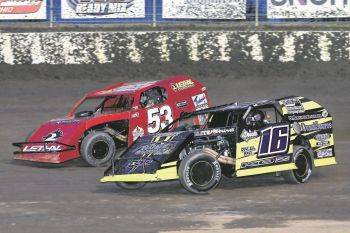 LIMA — A cool evening made for a super-fast track Friday night at Limaland Motorsports Park for the 18th annual running of Modified Mayhem. No. 53 Bobby Stremme joined his brother David as 2018 K&N Filters UMP Modified feature winners by grabbing the $1,000 to win, 20 lap A Main victory. No. 59 Tracy Fritter picked up the STARS Modified Lites feature, and No. 463 Daniel Sanchez made it 3 for 3 in Bud Thunderstock action. Kicking off racing action were the K&N Filters UMP Modifieds. No. 16 Jeff Koz and Stremme brought the field to green. A seven-car pile up blocked the track resulting in a red flag to clear the wreckage. On the restart, Stremme moved to the front with Koz in tow, and last week’s feature winner, No. 3W Dylan Woodling close behind. Following a caution, Woodling made his way past Koz for second. Stremme and Woodling then traded the lead on lap 13 before Stremme pulled ahead for good. Heat races were won by No. 65 Todd Sherman, Woodling, and Stremme. Next up were the STARS Modified Lites with No. 99T Tyler Riggs and No. 98 Matt Ward on the front row. Riggs grabbed the lead. A yellow flag on lap 3 allowed the field to close back in, and No. 59 Tracy Fritter charged to the front. Riggs stayed close before nearly spinning on lap 10, allowing Fritter to get away by nearly a full straightaway. On lap 12, No. 55 Marty Lunsford went upside down exiting turn 2, flipping end over end, bringing out the red flag. Lunsford walked away under his own power. On the restart, Riggs made one final run at Fritter but Fritter held on to pick up the victory. Heat races were won by Fritter and No. 16S Rob Jones. Completing the nights action were the Budweiser Thunderstocks in a 15-lap feature. No. 87 Andy Welch and No. 463X Jordan Conover paced the field to the green flag with Conover grabbing the early lead with teammate Daniel Sanchez close behind in the No. 463. On the restart following a lap 2 pileup, Sanchez and No. 82 Chris Douglas battled for second with Conover in the lead until his ride started overheating, forcing him to take his car to the infield, and handing the lead to Sanchez. Douglas hounded Sanchez the final 8 laps, but came up short, finishing second. Heat races were won by No. 27 Frank Paladino Paladino, 22T-Tony Anderson and Douglas. Racing returns to Limaland on Friday night as Post Printing presents the Busch Clash, and Meet the Drivers night, featuring NASCAR’s Ken Schrader. In action will be the K&L Ready Mix NRA Sprint Invaders, Ken Schrader will compete against the K&N Filters UMP Modifieds, and the Budweiser Thunderstocks are back in action. Pit gates open at 4:30 p.m., Grand stand gates open at 5PM, Hot laps at 6:30 PM and racing starts at 7:30PM. General admission for ages 16 and older is $12, ages 11 to 15 $6 and those 10 and younger get in free. Pit passes for all ages are $25. For more information go to limaland.com.